This dessert needs no introduction.. It is the most popular and preferred one in the Indian Cuisine all over the world. Baking powder .... 1 tsp. 1. Add one and quarter cup water to the sugar and boil to make syrup. Add cardamoms and saffron to the syrup. 4. Keep turning them continuously to get the even colour. Thanks!! I hope you will try the recipe. Do send your feedback if you try it out. Do check out the other desserts too. Just click on the label titled "Sweet Tooth". I have been making them this way since 40 years.. Right u are Sowmya.. I never buy them. 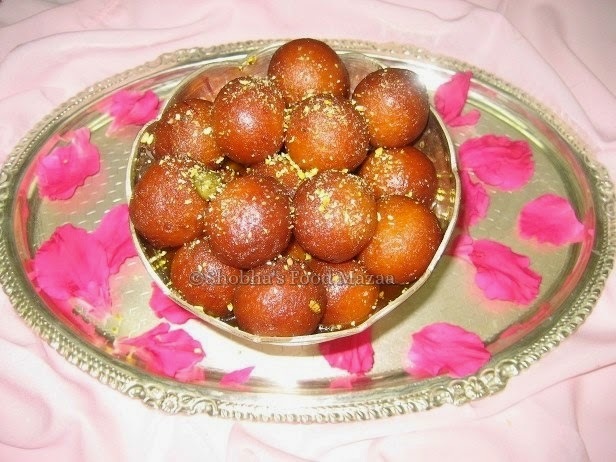 Delicious homemade gulab jamun. Looks awesome. wow!looks sooo tempting!all time fav...Shobha!u have a wonderful space dear!!! Hi Di Luv the recipe.... Can u plzz tell me which Milk powder do we use, Whole Milk powder or Non Fat Milk powder? Kindly reply. Thxx. Hi Namrata, use full cream milk powder.. If you are in India you can make use of Amulya. Namrata, Nido is fine .. I use it for all my desserts.. Yes use melted ghee but at room temperature.. not too hot. These look delicious white flour do you mean all purpose flour or chapatti flour? Nayna It is all purpose flour..